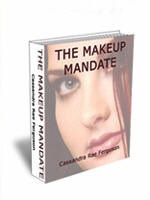 The Makeup Mandate is a 'How To' makeup e-book written by professional makeup artist Cassandra Rae Ferguson. The first of three in a series of books, The Makeup Mandate is made to read as if it were a mini makeup course. Some of the lessons included are: defining your eyes, makeup for facial shapes, contouring, makeup on a budget, makeup for young and mature skin, and even a section on makeup for men! This 200 page e-book teaches readers about everything from how to create bigger lips and apply false lashes to correction makeup for blemishes and scars. There are colour schemes and principles to show what suits different skin tones and eye colouring, and quick minute makeup applications for those who need a beauty fix up on the run! Readers are able to become their own makeup artist by recreating looks seen on models within the pages of the book and there are little extra tips in each section to help guide you along the way. The Makeup Mandate encourages readers to find their own style, be bold and adventurous and to experiment and express their creativity with whatever makeup looks they desire. This is a book which sets out to show that sticking by the old school rules of makeup application and style need no longer apply, because everyone is unique and has their own way of making themselves look and feel fabulous! Cassandra Rae Ferguson is a Freelance Makeup Artist based in Sydney, of over ten years. Cassandra has worked in the Australian fashion, television/film, editorial, glamour and bridal makeup industries and now works as a Freelance Beauty Writer as well. She is commonly consulted for her extensive makeup knowledge; her advice often featuring in bridal, beauty & lifestyle magazines. Cassandra's written work has been published internationally. In addition, Cassandra has penned a trilogy of makeup how-to books and runs a successful makeup blog providing expert makeup advice. She has a passion for providing expert information about makeup without being dictatorial; keeping makeup enjoyable for those at every level of experience.